On May 25, 2011, astronomers announced at the 218th Annual Meeting of the American Astronomical Society that they had detected and imaged 42 apparent, blue straggler stars in the Milky Way's Central Bulge, of which 18 to 37 may be genuine. Real blue stragglers should exhibit signs of lithium, carbon and oxygen depletion, which are chemical signatures of past mass transfer from less massive and older stars, and a blue straggler’s spin period may also indicate whether the star evolved from a binary merger. These stars appeared to be bluer and so younger than most other, apparently older, stars in the central bulge, of which only 3.4 percent were born over the last five billion years. The blue stragglers were detected as part of a seven-day-long 2006 survey called the Sagittarius Window Eclipsing Extrasolar Planet Search (SWEEPS), when the astronomers used the Hubble Space Telescope (HST) to observe and collect variability data on 180,000 stars in the central bulge (Hubble news release; NASA feature release; and Shweta Krishnan, Sky and Telescope, June 10, 2011). 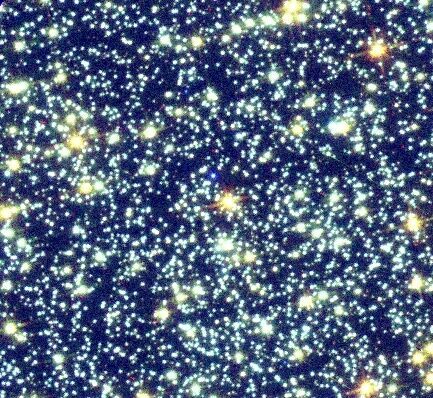 "Blue Stragglers" are unusually hot and bright stars found in the cores of ancient star clusters known as globulars. 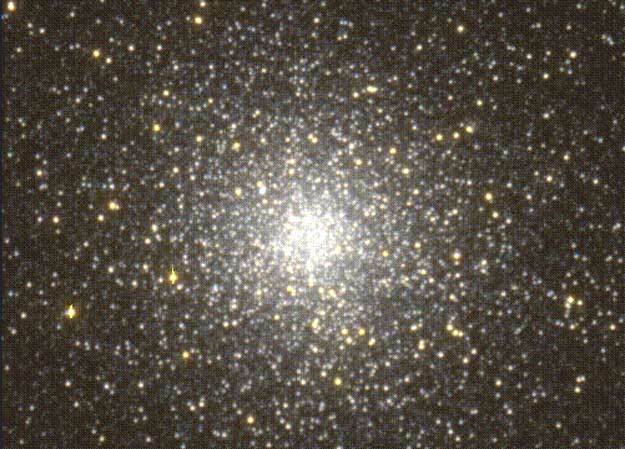 Globular clusters are located in galactic halos, of which the Milky Way may have from 180 to 200, or more. Most are located at least several thousand light-years away from Sol, and most are around 12 billion years old or more. The Milky Way's largest and brightest globular is Omega Centauri (NGC 5139), which contains about 10 million stars totalling about five million Solar masses spread over some 150 light-years. 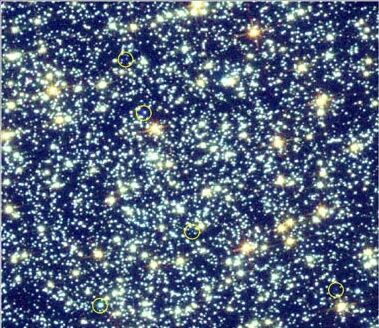 In large globular clusters, a million stars may be crammed into a space that measures only a few dozen light-years across. By comparison, an equivalent volume in the Solar Neighborhood would contain only several hundred stars. As a result, stars in globular cores are much more likely io suffer gravitational interactions, where lower-mass stars and stellar remnants tend to be ejected from the cluster by energy transfer from higher mass stars (or binaries) which then fall in closer together towards the cluster center. Given the relatively slow motion of stars in globulars and enough time, some of their tightly packed stars, brown dwarfs, and stellar remnants (white dwarfs, neutron stars, and black holes) may eventually collide. 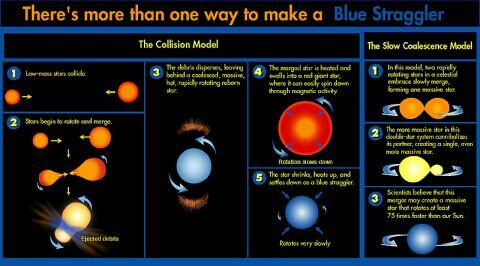 Collisions with stellar remnants tend to obliterate main sequence dwarfs, but main sequence stars and brown dwarfs sometimes merge into a single, more massive star that is larger, hotter, and bluer than either pre-merger object (see some animations). 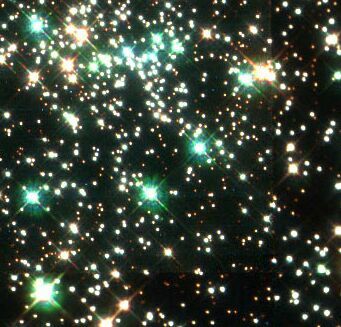 It has been estimated that half of the stars in the central regions of some globular clusters may have undergone one or more collisions over the past 13 billion years (Michael M. Shara, Scientific American, November 2002). 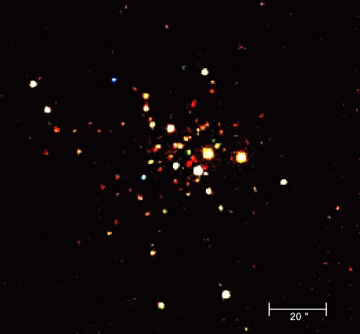 By August 1997, 21 anomalous, blue straggler stars (including BSS 19) had been found in globular cluster 47 Tucanae (STScI Press Release), the second largest and brightest globular of the Milky Way's halo (Shara et al, 1997). 47 Tucanae (NGC 104) is located in the southern part (0:24:5.19-72:4:49.9, ICRS 2000.0) of Constellation Tucana (see photo by David Malin), the Toucan -- southwest of Kappa Tucanae, roughly south of Epsilon, Zeta, and Beta1,2 Tucanae, west of the Small Magellanic Cloud, and north of Theta Octanis and Beta Hydri. 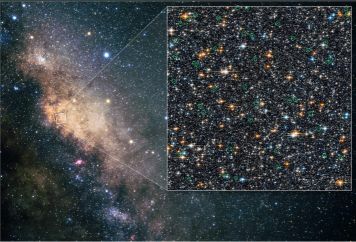 Its several million stars are spread over a volume nearly 120 light years across, most of which may be around 13.5 +/- 2 billion years old (Hesser et al, 1987). Approaching Sol at about 12 miles (19 km) per second, the globular was discovered by the Abbé [Abbot] Nicholas Louis de La Caille (1713-1762) and cataloged in his list of southern nebulous objects. Empirical evidence for stellar collisions is found in the crowded core of 47 Tucanae, which is full of unusual compact binary star systems (where a normal star is paired with a white dwarf, neutron star, or a black hole) in unusually large numbers rarely found outside of globular cores. The globular's core includes exotic objects such as milli-second pulsars, which are neutron stars that are rotating extremely rapidly (between 100 to nearly 1,000 times a second) as if they have the rotational energy of formerly two objects that recently merged. Most, or all, of the stellar-sized black holes that have formed over the lifetime of the cluster may have been ejected by slingshot encounters with binaries deep in the cluster core. (more from Astronomy Picture of the Day and the Chandra X-Ray Observatory). 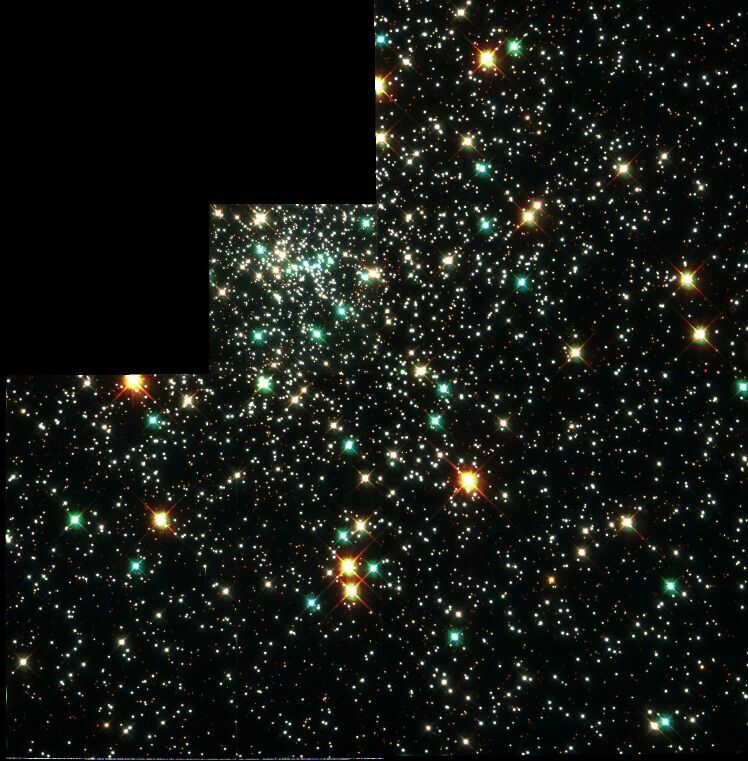 Merged stars also stand out conspicuously as bluer and brighter, relatively massive stars in the crowded cores of many large globular clusters like 47 Tucanae. Since most members of ancient globulars are born at the roughly the same time, however, their relatively more massive stars should have already evolved out of existence. Hence, relatively young, more massive stars borned of mergers tend to stand out conspicously among their redder, smaller and dimmer elders, that have survived since the cluster's birth around 10 to 13 or more billion years ago. Many astronomers believe that the presence of anomalously hot and bright, blue stragglers in the dense cores of globulars provides strong evidence of stellar collisions resulting in merged stars (Paresce et al, 1991). Rex A. Saffer of Villanova University and colleagues have found a blue stragger in globular cluster NGC 6397 to be three times as massive as any ordinary star in that cluster, which they and other astronomers believe must have formed from a collisional merger (Sepinsky et al, 2000; and more information and images at APOD). Blue stragglers like BSS 19, however, can also form from the slow coalescence of contact binary stars, or of a star and brown dwarf. (More discussion from Charles Danforth's Blue Stragglers: A Study of Stellar Longevity). (BSS 19 was probably formed by the slow coalescence of contact binary stars -- more). 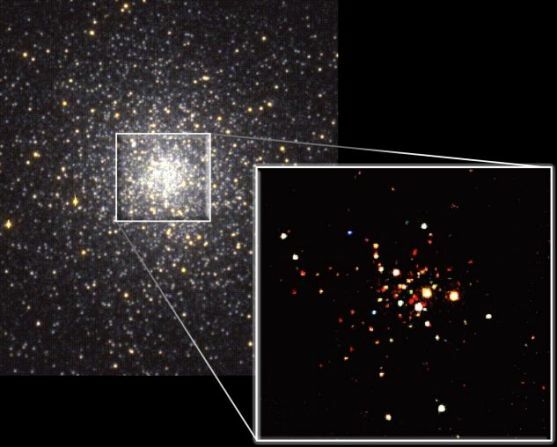 On October 2, 2006, a team of astronomers announced that they had found evidence that six of 43 blue stragglers in globular cluster 47 Tucanae formed by the slow coalescence of contact binary stars. The six blue stragglers contain less carbon and oxygen than the remaining 37, which suggests that the material at the surface of six came from deep inside their parent stars. In theory, however, this deep material can move to the surface of a blue straggler only during the mass transfer process occurring between two stars in a binary system, which is supported by numerical simulations (ESO press release). Stellar cannabalism in binary systems (whereby gas is drawn from a companion star) has gathered support from the "binary evolution" or "slow coalescence" model (more below) as the primary formation mechanism for blue stragger stars (UK STFC press release; Knigge et al, 2008; Chen and Han, 2008; Lu Deng, 2008; Andrea Thompson, Space.com, January 14, 2009; and Astronomy, January 14, 2009). 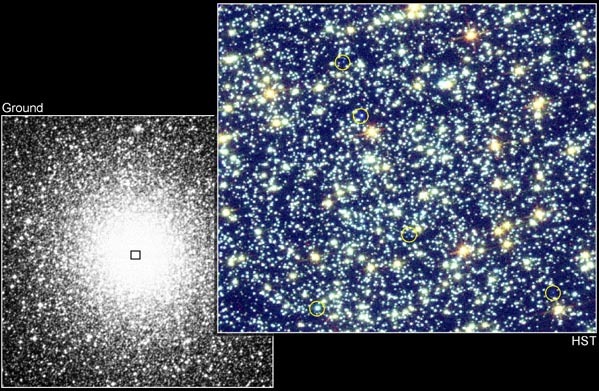 A team of astronomers counted the number of blue stragglers in 56 globular clusters and found that the their numbers in a given cluster did not match the prediction by the competing collision model, whereby blue stragglers are created through collisions with other stars. 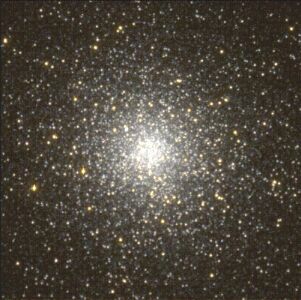 The team, however, found a relationship between the total mass contained in the core of a globular cluster and the number of blue stragglers observed within it, where more massive cores also contain more binary stars which the researchers believes can be used to infer a relationship between blue stragglers and binaries in globular clusters. 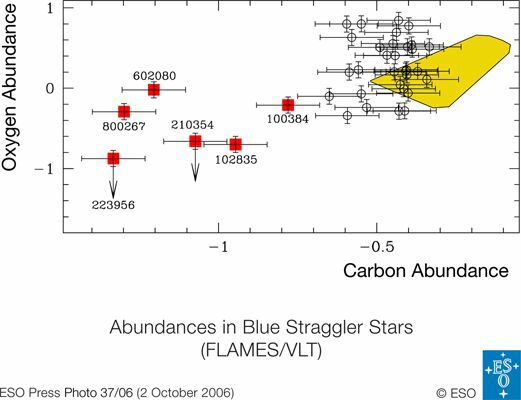 In addition, an earlier 2006 study had investigated the chemical composition of 43 blue stragglers in globular cluster 47 Tucanae and found that six them had less carbon and oxygen than the others, which indicated that their surface material had been sucked from the deep interior of a parent star in a binary system (ESO press release; Ferraro et al, 2006; and Space.com, October 5, 2006). As a star formed from a merger (of smaller stars, brown dwarfs, or a combination) will have hydrogen from its outer layers mixed into its core, it will have fresh fuel for core hydrogen fusion. The resulting higher stellar mass, moreover, will burn hotter (and bluer) and faster so that a star of two Solar masses will last only 800 million years, compared to a one-Solar-mass parent star (like Sol) that could have lived for 10 billion or more as a main sequence dwarf. Hence, blue stragglers like BSS 19 will burn out long before their dimmer and redder, ancient neighbors will. It is likely that most planets that may have formed around BSS 19 or have been lost to interstellar space or the star itself from gravitational perturbations during its formation. Indeed, a recent search for Jupiter-class planets in a globular cluster seem to have found none (Gilliland et al, 2000). In any case, any developing carbon-based life on a developing Earth-type planet would have been subject to the intense and deadly radiation produced by the stellar merger of the original contact binary stars. Tucana is a small constellation located around the South Pole. For more information about the stars and objects in this constellation and an illustration, go to Christine Kronberg's Tucana. For another illustration, see David Haworth's Tucana. © 2002-2011 Sol Company. All Rights Reserved.